My rebellion was a departure from all of the traditional ingredients. 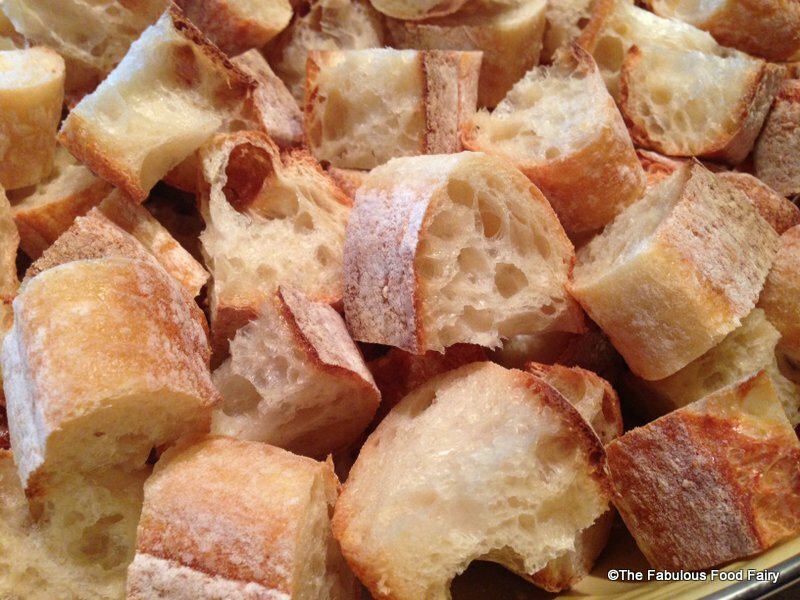 I swapped dried bread cubes for a loaf of fresh ciabatta bread. 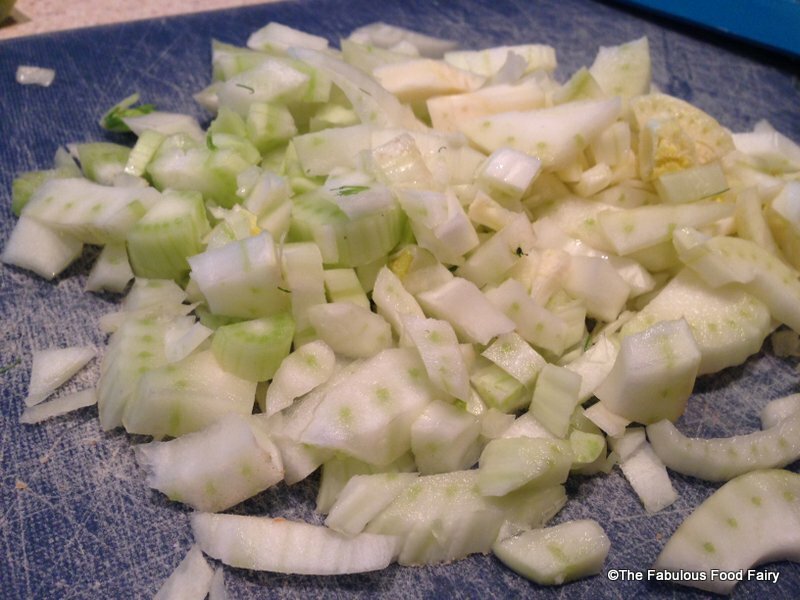 I’ve ditched the onions for shallots & garlic, and I tossed the celery in favor of fennel! The sausage stayed, because it’s tasty. I pureed, sauteed, tossed, and baked. Then we tasted, smiled, and let the satisfaction seep in. I have done it. 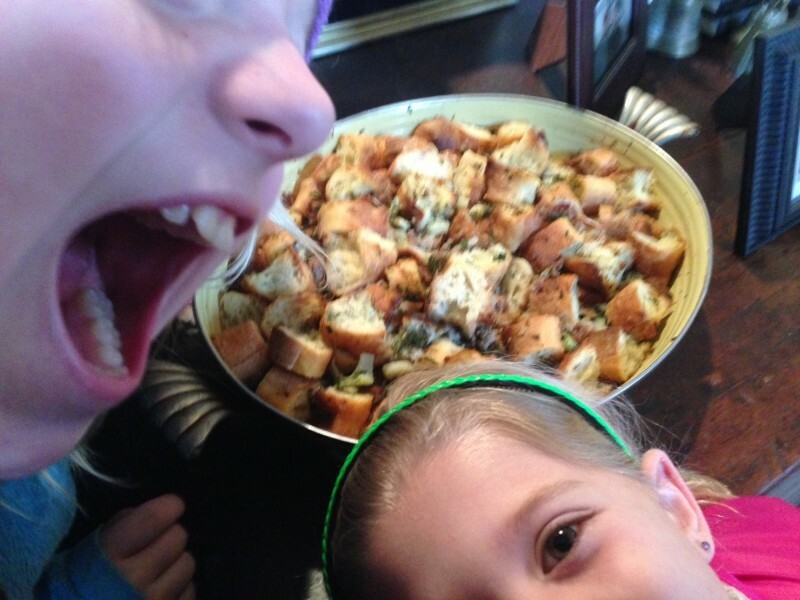 I have created a stuffing that my kids adore! In fact, they cried when I swatted their hands away and stashed the new deliciousness for its formal unveiling tomorrow. Mission complete, rebellion successful, personal satisfaction. I am now one happy lady that did “go all food fairy” this year, and I’m pretty damn proud of myself! 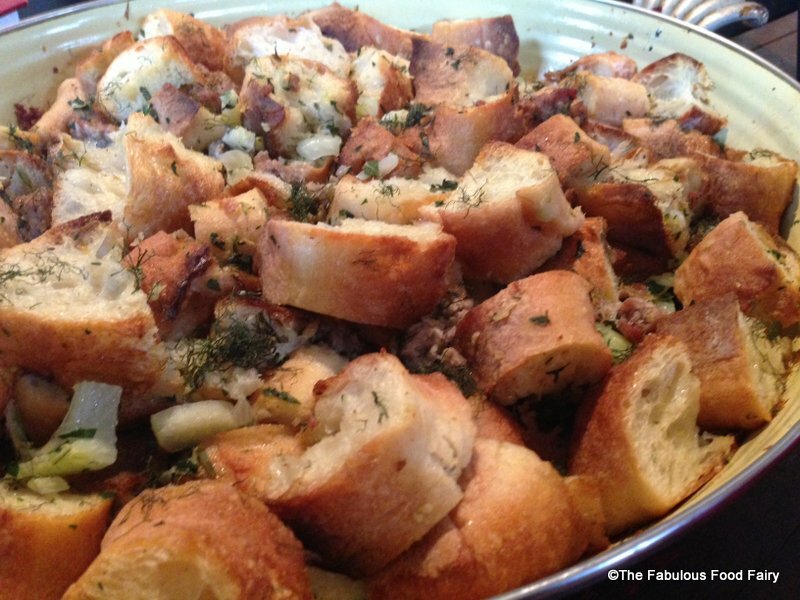 Cut the bread into large cubes and place them in a large roasting pan. Next, brown the sausage in a large skillet, until fully cooked. 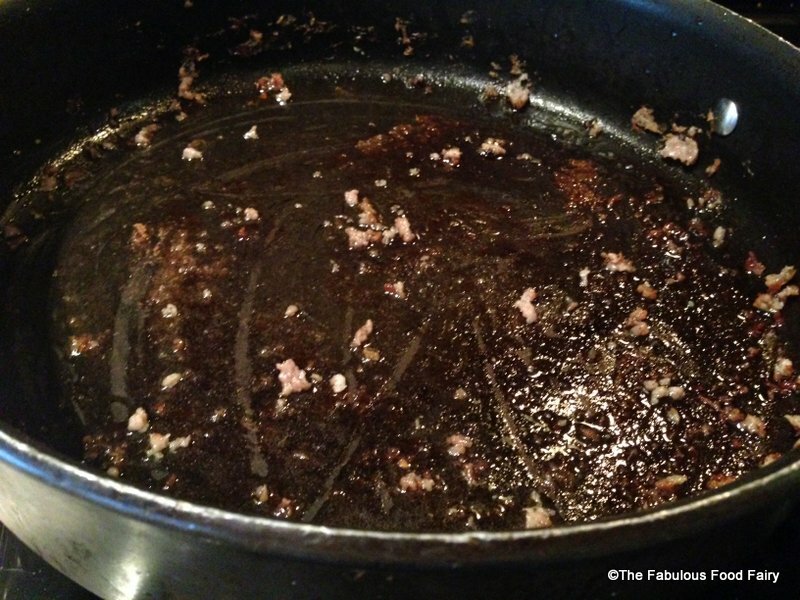 Drain and set aside, but do not wash the pan. 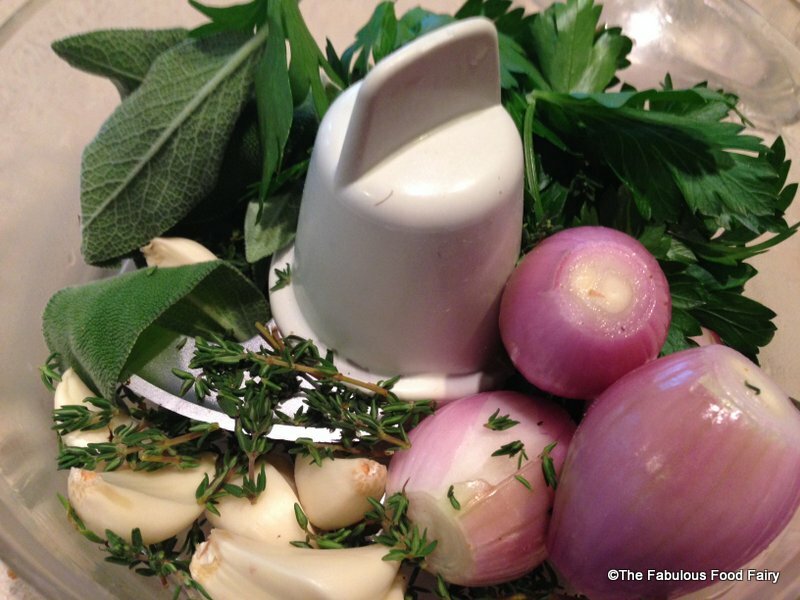 Now, combine the parsley, sage, thyme, garlic, shallots, and olive oil in a food processor and chop until fine. Dump the pesto into the same pan that you used to cook the sausage. 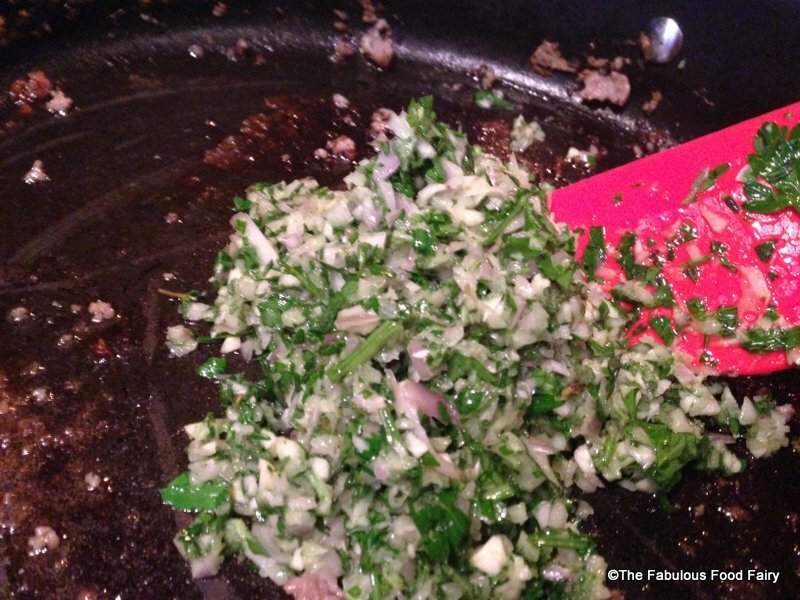 Coarsely chop the white bulb of the fennel into pieces (save the pretty tops), and add to the pan. 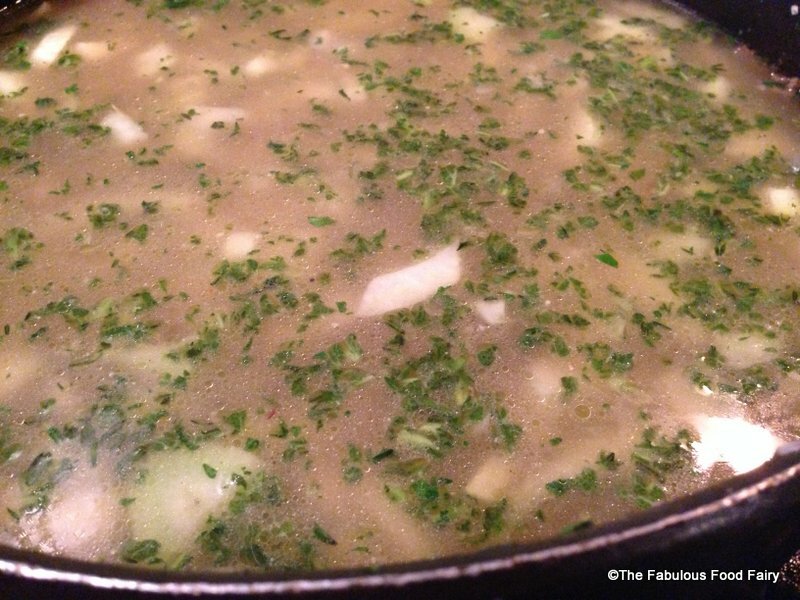 Sautee for 5-7 minutes over a medium heat until the fennel starts to soften and the garlic and shallots have also browned a bit. Next, add the stock and stir, de-glazing the pan and scraping up all of the yummy leftover sausage bits. 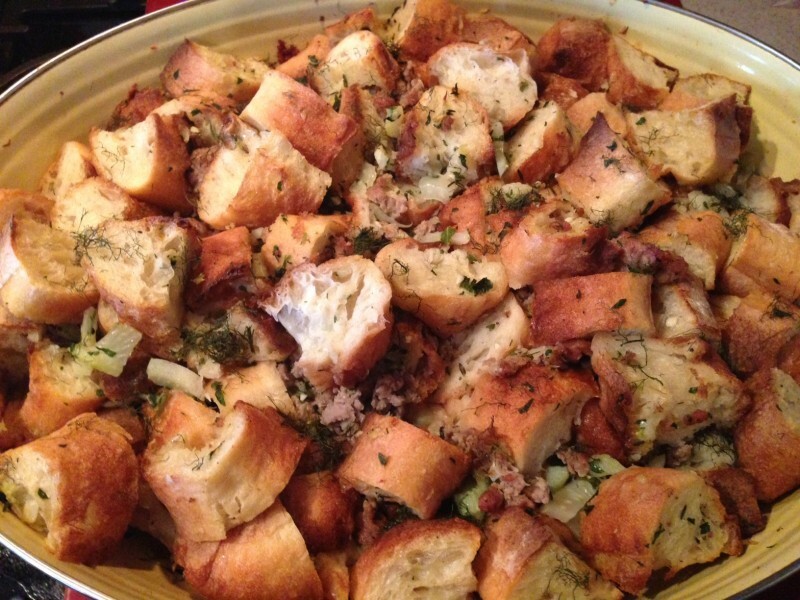 Toss the drained sausage with the bread cubes, then add the liquid mixture, pouring it evenly over the bread and sausage.Use a large spoon to toss the stuffing, ensuring that everything is well mixed, but being careful not to smoosh the bread into a paste. 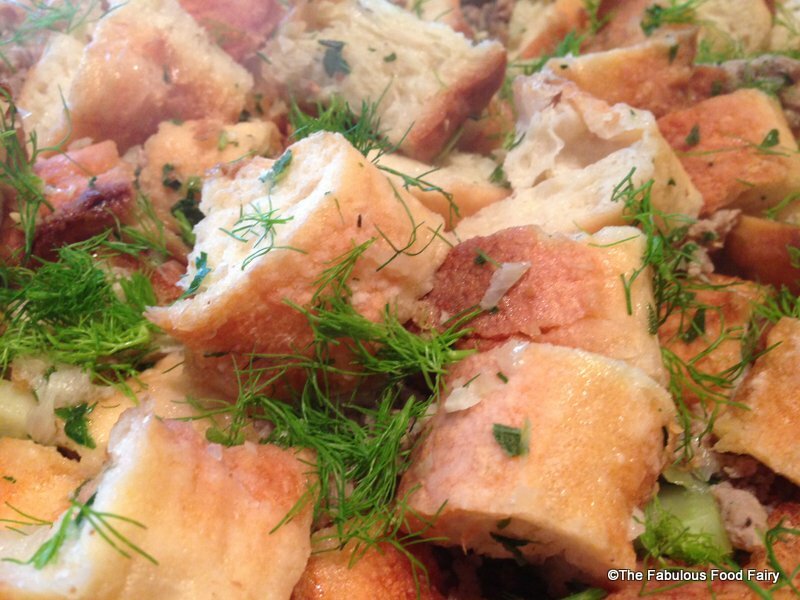 Once it is well mixed, chop the feather fronds of fennel and sprinkle them evenly over the top of the stuffing to make it look really pretty. Bake at 350 for about 30 minutes, or until it is hot and the cubes on top are brown and crispy. And cook some good food. Is a meal that’s divine! Today was a yucky rainy Sunday. The only thing I had to do was run out to the pharmacy. I didn’t want to shop, I would not clean, I just wanted to veg. Cold and rainy weather is not my friend. Days like today, I just want warm…a warm blanket, a warm cozy spot on the couch, and a warm tasty meal. The problem is that once I settle into that warm cozy spot on the couch, under my warm fleecy blanket, with my warm snugly doggie at my feet, I don’t want to get up. 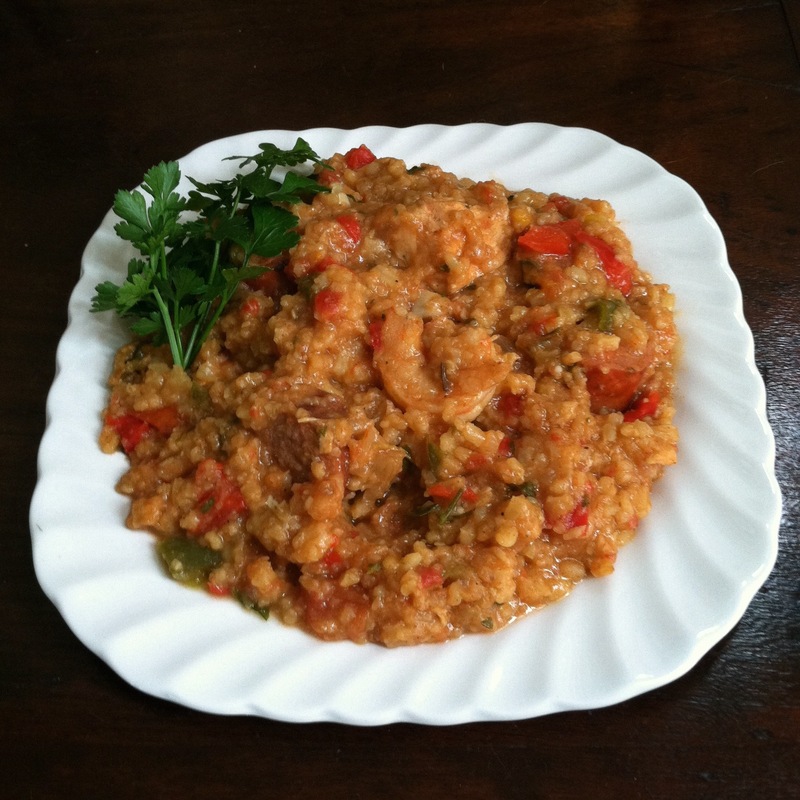 Crockpot jambalaya is a prefect recipe for this kind of day. This recipe is perfect for the lazy cooking days. No lengthy prep, no constant stirring, no elaborate finishing process. Just cut, dump, wait, and then eat. In fact, this dish is so efficient in promoting relaxation, I grant you permission to deviate from the traditional dinner table and eat it in the family room while watching a movie as a family. Tonight, my kids will settle in on the floor, spread a large blanket beneath them, and enjoy dinner, “picnic style”. It is a fun treat, and I use the format to bribe (or threaten) them into eating it all gone (ex. “If you do not eat all of you dinner, we will not be able to have picnic dinners again!”…I know, they will need therapy…blah, blah, blah.) My husband and I will claim the couch, and a movie will be chosen. Peace, family, warmth, and a great meal are the necessary ingredients to make this a fantastic Sunday. So, whether you are an experienced cook, who just wants to take a night off, or a novice kitchen mom, who is looking for a low-risk start, this is the recipe for you. Not only will your family love it, but you will feel relaxed and fulfilled by your new cooking from the couch skills. Enjoy! Combine all ingredients in your slow cooker. Cook on low for 7-8 hours, or on high for 3-4 hours. Stir occasionally. Garnish with a slice of warm cornbread. 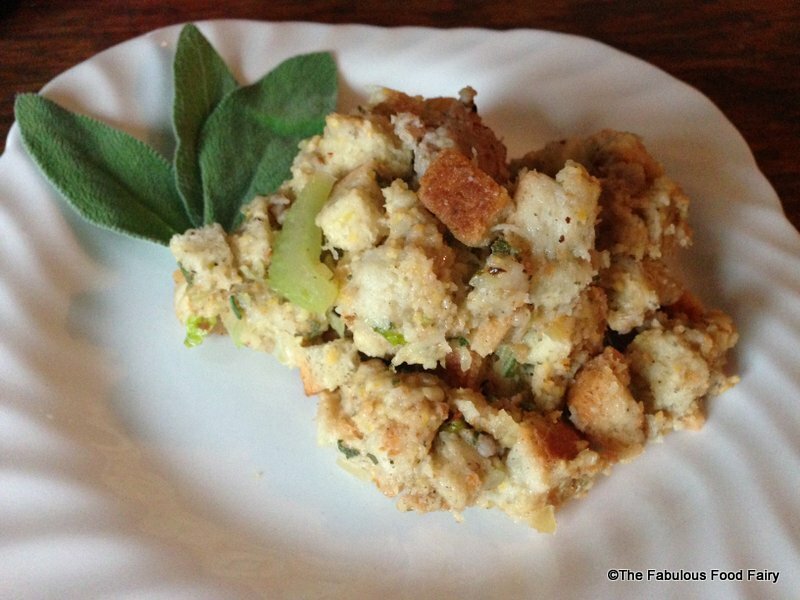 I recently had the opportunity to write a guest post for the website http://www.justshortofcrazy.com be sure to check out my post here My Mother-in-law’s Stuffing and check out her other very helpful posts! Saute sausage, drain, and crumble. Set aside. Chop onions and celery finely and saute in butter and spices until soft. Bake in the oven at 350 degrees until it is hot throughout and brown around the edges. Approximately 45 minutes. 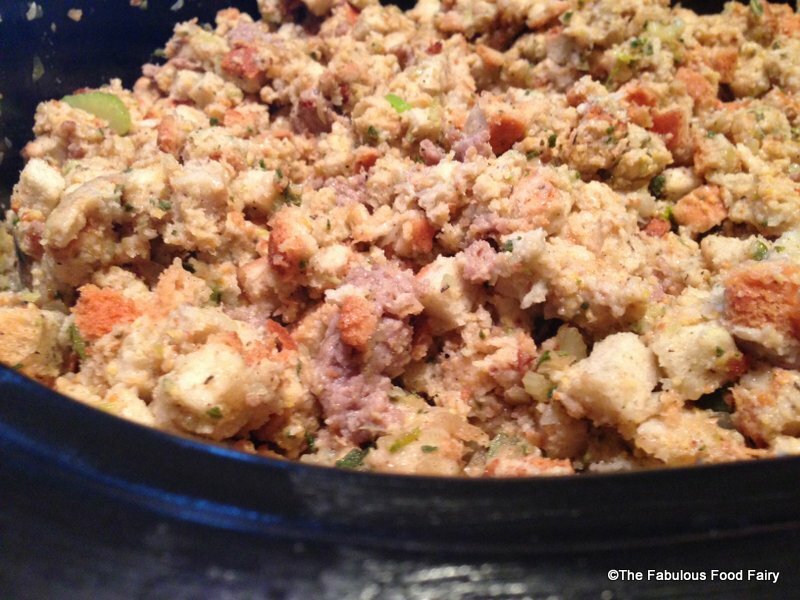 ***This makes enough to compliment a family of stuffing lovers and a 10-12 pound turkey.